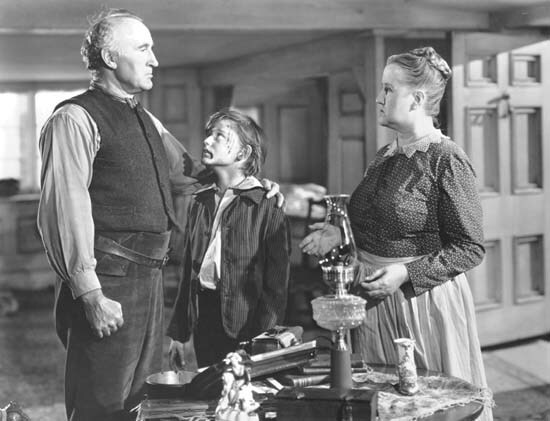 Like the previous Oscar-winning family drama “Cavalcade,” John Ford’s 1941 “How Green Was My Valley” was a smash-hit at the box-office even before earning its multiple Oscar nominations (and later awards). Indeed, “How Green Was My Valley” reaffirmed Ford’s populist ideology, propagated the year before in another Oscar-nominated family saga, “The Grapes of Wrath,” starring Henry Fonda. Nonetheless, “How Green” was not associated with the anger and leftist politics of John Steinbeck, the author’s book, upon which “Grapes of Wrath” was based. Based on Richard Llewellyn’s novel, adapted to the screen by Philip Dunne, “How Green” tells the story of a Welsh mining family, narrated by its youngest son, Huw Morgan (child actor Roddy McDowall). Ford’s idealized view of the past is seen through the memory of the boy, surrounded as he is by a large, loving family. As in other films, Ford draws parallels between the breakdown of the Morgan family and that of the surrounding community, and by implication America society at large. “How Green Was My Valley” is one of Ford’s most lyrically beautiful, if also sentimental, pictures. The critic Andrew Sarris has described the movie as an elegiac poem, and for many it was. The film’s portrayal of the disintegration of a mining community is of epic and heroic dimensions. Nominated for ten Oscars, the film won five, honoring Ford’s Direction, Arthur Miller’s Cinematography and Art direction. 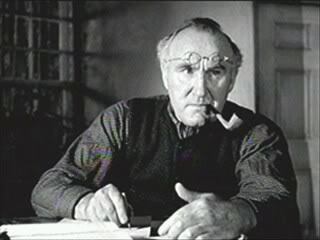 Sara Allgood was nominated for Supporting Actress, as the gentle but strong mother, Beth Morgan, and Donald Crisp won the Supporting Actor Oscar for playing Mr. Morgan, the stern patriarch who is later killed in the mine. Not to be underestimated is the fact that “How Green” film was selected by the Academy voters while the U.S. had already been involved in the War. The film’s warmly sympathetic depiction of family unity must have hit deep chords in the country’s collective consciousness, which may explain, at least in part, why its two major competitors, Orson Welles’s masterpiece, “Citizen Kane” and William Wyler’s “The Little Foxes,” each with nine nominations, were the losers. Both films, and particularly “Little Foxes,” represented dark and somber visions of the American family. Once again, the “right” contents and ideological approach made the difference, though it is noteworthy that “How Green” was as visually distinguished, as it was thematically acceptable. Indeed, there was nothing really divisive or particularly agitating and provocative about this well made, enjoyable film, which focuses on the family as a scared institution. A monologue by the older Huw Morgan (voiced by Irving Pichel) begins the story: “I am packing my belongings in the shawl my mother used to wear when she went to the market. And I’m going from my valley. And this time, I shall never return.” The camera then tracks the valley and its villages blackened by the surrounding coal mines. Huw (Roddy McDowall), the youngest child of Gwilym Morgan (Donald Crisp), walks home with his father to meet his mother, Beth (Sara Allgood). His older brothers, Ianto (John Loder), Ivor (Patric Knowled), Davy (Richard Fraser), Gwilym Jr and Owen work in the coal mines with their father, while his sister Angharad (Maureen O’Hara) helps their mother with domestic chores. Huw’s childhood is idyllic, warm and loving family in a town not yet overrun withmining effects. Huw is smitten when he meets Bronwyn (Anna Lee) engaged to his oldest brother, Ivor). At the wedding party, Angharad meets the new preacher, Mr. Gruffydd (Walter Pidgeon). When the mine owner lowers the wages, the miners protest with a strike. Gwilym’s attempt to mediate, but his effort estranges him from the other miners and his older sons, motivating Beth to interrupt a meeting, threatening to kill anyone who harms her husband. While returning home, Beth falls into the river, and Huw dives in to save her. Temporarily losing one of his legs, he later recovers with the help of Mr Gruffydd. The strike is eventually settled, and Gwilym and his sons reconcile, but many miners lose their jobs. Angharad is courted by the mine owner’s son Iestyn Evans (Marten Lamont), though her heart is set on Mr Gruffydd, who loves her too. The gossipy townswomen can’t bear the idea of Angharad living impoverished life, and she submits to a loveless marriage to Evans. Huw begins school at a nearby village, and bullied by the other boys, he is taught to fight by boxer Dai Bando (Rhys Williams) and Cyfartha (Barry Fitzgerald). Bronwyn gives birth to their child the same day Ivor is killed in a mine accident. Later, the four Morgan sons are fired and less experienced, cheaper laborers replace them. With no job prospects, they seek their fortunes abroad. Huw is awarded a scholarship to university, but he declines it in order to work in the mines. He moves in with Bronwyn to help provide for her and her child. The alarm whistle sounds signal another mine disaster, in which some men are injured, and Gwilym and others are trapped. Young Huw, Mr. Gruffydd, and Dai Bando descend with others in a rescue attempt. Gwilym and his son are reunited before he dies of his injuries. Huw cradles his father’s body, with his coal-blackened face revealing loss of innocence.